We’re pleased to service the Oakville, Halton and surrounding community as we continue to grow within Ontario! Operating this specialized school bus services location means employing highly qualified drivers, technicians and an experienced team of operations specialists and management. 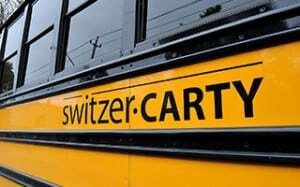 At Switzer-Carty Transportation, Oakville Branch, the skill and commitment of our team replicates our best-in-industry customer service, safety and reliability provided throughout Ontario. School districts and parents entrust us to transport their children to and from school every single day. Private groups also count on us to take them on trips throughout the Halton Region, the GTA and beyond throughout Ontario. With us every single student and passenger that boards our buses has our commitment to provide top quality, safe travels and on-time service. The Oakville Branch fleet includes full sized school buses and mini-buses to meet the needs of school districts and private group rentals. We provide private charter bus rentals, with access to an extended fleet of luxury coach style party buses. These air conditioned party buses are a great option for special events like weddings, corporate or other party events. Our Oakville bus fleet services all areas in Halton; including Burlington, Milton and West Mississauga. School board customers include Halton District and Halton Catholic District School Boards. Services are also available for private schools throughout the Region. Rich Bagdonas, Branch Manager/HR Business Partner, leads our Oakville bus operations with a goal of providing the best service to our customers and team of employees. Rich draws on a depth of experience, having lead multiple teams in the area of school bus transportation and welcomes your inquiries. Whether you’ve questions about our contract school district or charter bus rental services, or joining our fantastic team, contact us today! Do you live in Oakville, Burlington and area and are interested in driving a school bus in Halton Region? Would you love to join a committed team that loves children, is passionate about safety and working outside a typical office environment? Every day is new at Switzer-Carty Transportation in Oakville! Whether you’re a stay at home mom or dad, semi-retired or just looking for part time work while enjoying what you do, then we’d love to chat! All employees receive great training to prepare them for their professional career with us. Please apply here and we’ll quickly follow up with you.